The Kremer Pigmente Recipe Book has been awarded the 1st place of the "Creative Impulse Award 2019". "And the winner is ...", so it was said Saturday, January 26, at the award ceremony of the "Oscars“ of the hobby, creative and art supplies industry at Creativeworld, the leading international fair for the creative market. With 46 submissions, numerous companies from Germany and abroad have again applied for the coveted Innovation Prize. For the 14th time, Messe Frankfurt awarded this renowned prize in cooperation with the trade magazine HobbyArt. Kremer Pigmente is pleased to announce the first prize in the category "Creative Book of the Year" with the submission of the "Kremer Pigmente Recipe Book". With the recipes, the reader gets a guide to the hand, with which he can make a color himself according to his individual needs. The Recipe Book helps to find the suitable pigments and materials for specific application! The 37 recipes are divided into the following categories: water color, tempera, acrylic paint, wall paint, oil paint and oil varnish, as well as other pigment applications. for the RRP of 14,50 € (VAT included plus shipping costs). The hue ranges from red to copper to gold, especially on a dark ground or when used with a dark transparent pigment. 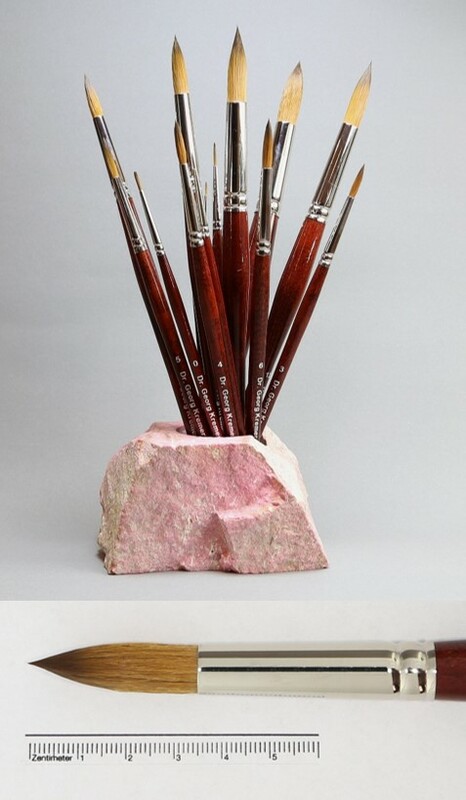 This pigment is based on natural muscovite mica, with a special titanium interference layer. Color hue was predicted using sophisticated, complex colorimetric calculations. With its exceptional color saturation and specially developed grain size distribution, this pigment sets a new standard. Its excellent performance and resistance to environmental influences, even outdoors, give the PYRISMA® interference pigment an ideal property profile. in 10 g, 50 g, 100 g and 1 kg. The colored liquid is achieved by mixing water and a colored powder which is then applied on an absorbing supports like paper. Watercolor will last throughout ages if used on dry and stable surfaces which are protected against abrasion. They have already been used in prehistoric cave painting. Gum Arabic is often used as a binder for watercolors because it dissolves easily in water. This natural gum is usually collected from various species of the North African acacia tree. Watercolors usually appear translucent or glazing even when painted in thicker layers. Gouache color is made by adding an opaque white pigment to the watercolor. In the past, painters used mostly lead white for this technique but today zinc white and chalk from champagne are more common. Staining color can be sealed with a fixative – similar to the ones used for pastel. If the color needs to be water-resistant you should work with tempera technique. The Kremer watercolor painting agent is ideal for creating an individual water color in a very simple and effective way. It contains gum arabic with honey and glycerin as plasticizer for best shelf life. Take a few drops of the watercolor medium (#79260) and a little distilled water (#65000) on 1 - 3 teaspoons dry pigment. Grind the pigment with a glass muller or in a mortar to a homogeneous, lump-free paste. The color of the very different sized spherical pieces varies between very pale, brownish yellow to delicate reddish brown tones. The pieces may contain impurities, so you should filter the aqueous solutions. The mixing ratio with water is entirely at will and depending on the intended use. Normally 1 volume of rubber in 2 parts of water is dissolved overnight. If the gum solution is to be used to make watercolor paints, add some glycerin (up to about 5 or 10 percent). As an alternative to the gum arabic pieces, you can quickly make a gum solution using the highly purified, standardized powder. The hair has been developed as an alternative to natural Kolinsky hair. It perfectly simulates natural Kolinsky hair in elasticity and water holding capacity. The excellent matching of hair leads to a brush with excellent „belly“ and perfect tip. to the RRP of 8,50 € (VAT included plus shipping costs). International Fair for Classic Modern and Contemporary Art. Europe's trade fair for facade design & interior architecture. Tagung „Die Fassung bewahren. Konservierung und Restaurierung polychromer Bildwerke“. 24 èmes Rencontres Internationales des Peintres Décorateurs.